The Club is one of a number of specialist Clubs based at the One Leisure St Ives Outdoor Centre. It caters for all those who wish to enjoy social or competitive squash and racketball (squash 57). The club has much to offer and wants to do more for its members with your help and input. Our committee is fully committed to putting on lots of events for the benefit of our members and to encourage the uptake of squash and racketball in the community. The Pairs competition was a particularly successful event. We had 17 participants on the night, all of whom had a good time and we followed the evening up by putting on some food and drink for members in the bar area. It is our intention to provide a lot more events like this, and we have put together a membership package which is excellent value for money. Club night resumes on Mondays at 7.40pm from 10th September after a short summer break. Members receive a discounted fee of £3 (£2 for juniors) to participate and can have a go at squash and racketball in a fun, friendly environment. It’s a great way of meeting other players and practising your squash with players of all abilities. We have held a range of members only events this year for all abilities such as the handicap speed squash tournament and the Pairs squash tournament. 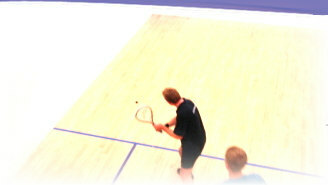 We also hold Squash and Racketball Club Championships annually. Members also receive discounted entry into Open events that the club runs at the Outdoor centre such as the St Ivo Racketball Open. The club has two mixed teams in the Cambridgeshire leagues. The 1st team, captained by John Dewis, are currently promotion contenders in the 2nd division and offer the chance to play squash at a high level. The 2nd team is in the 4th Division and are expected to do well this year. The team run by Club Captain Alistair Paul offers an excellent introduction to the competitive yet fun nature of team squash for players of all abilities. Steven Mason, our level 2 qualified Squash coach, ran junior sessions over the summer holidays for ages from 4 to 18 years. Steve hopes to run some weekly sessions again starting in the Autumn. We would like to build a successful junior section of the club to ensure local youngsters have access to the great sport of squash in the area. Contact Steve for details and to register your interest. Group sessions are to be arranged, using coaches from within the Club and external qualified coaches to provide support to team players, upper and lower box league players, ladies and social players. Coaching will also be accessible on selected club nights. We currently have three coaches who the club have supported through qualifications, Steven Mason, Byron Williams, and John Dewis. One to one coaching sessions are available from Steven Mason. One Leisure run the box leagues published on the noticeboard. We encourage members to enter the box leagues and we are working with One Leisure to increase participation. To enter the Box Leagues complete an enquiry form for the One Leisure Outdoor Centre. We offer a variety of memberships from just £10. We encourage members to join England Squash by opting for our Silver or Gold memberships. England Squash have supported the club in the past and the benefits are very good value. We also have a bronze membership option which gives access to all the same club events and discounted activities for just £10 and players can upgrade later in the year should they wish to. Regular team players must have a Gold Membership. Your membership fees are essential to help us provide a framework to develop squash in the area. We pay England Squash court fees and player fees to help run the national governing body and support the network of County squash organization. The club pays for insurance, buys squash and racketball equipment including balls and safety wear and supports players who wish to train to be coaches. We also provide trophies and prizes for club competitions. The clubs main costs are court fees to Hunts District Council for organised club events such as club nights and club competitions. Teams players pay their own court costs.